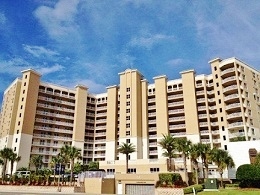 St. Maarten Condominium is one of the finest oceanfront luxury complexes on the drive beach of the Atlantic Ocean in Daytona Beach Shores. The Cook Development uphold their reputation for high end condos within St. Maarten. This 10 floor, 130 unit complex has many luxury amenities for the whole family. Capitalize on rental income with a 2 week minimum rental policy!